How Your Gut Can Keep You Happy: Mood Disorders and Gut Dysbiosis - YeastInfection.Org by Eric Bakker N.D.
November 3, 2015 by Eric Bakker N.D.
One of the main, yet least frequently mentioned problems which occurs in nearly all patients suffering from digestive issues whether they be SIBO, IBS, Candida or the myriad other illnesses which have now been linked to gut dysbiosis, is that of ‘emotional issues.’ Although many patients suffer from anxiety or depression, (and many in fact more severely than they report), there is such stigma attached to these conditions that they often go unreported. Many patients I have seen in my clinic over the years want to understand why they are experiencing personality changes and are seeking answers and solutions, but unfortunately for the majority of sufferers, any potential cause of their emotional issues remain unresolved and therefore few resolutions are found. For many, treatment generally involves pharmaceutical intervention while the cause remains unsolved. Unfortunately, there are still health care professionals who automatically interpret mood changes of their patient as being clearly distinct from any physical issues their patient may be experiencing. When no link is associated with a person’s physical and emotional symptoms, a separate treatment may be provided to the patient to mitigate their individual problems. As the number of people taking antidepressants continues to rise, for example in America the figure has risen from 11.2 million in 1998 to 23.3 million in 2010, and in Iceland a staggering ten percent of the population take some form of mood lifting drug, it transpires that unfortunately these drugs are prescribed (even in the absence of depression) when the patient is diagnosed with physical illness such as fibromyalgia, chronic fatigue or IBS. Because many patients are equally (or more) concerned about their physical problems, this can result in a reluctance to even mention issues relating to mood disorders, no matter how concerning they may be. After almost thirty years of clinical naturopathic practice I have learned that many patients are quite aware that their emotional problems are somehow linked to those of their physical – but unfortunately their ‘unconventional’ views are not supported by conventional medical science. And, despite the best intentions of their medical doctor, these same patients do not want to be treated as if they have somehow lost the emotional capacity to cope with the practicalities of day-to-day living, but rather instead want answers as to how their feelings could possibly be affected by physical illness. These same patients, despite not being educated in mind-body medicine, are certain that both aspects of their illness are not only linked, but are very real. I would like to reassure patients who suffer from symptoms commonly associated with gut dysfunction that the emotional effects of digestive problems are as real as physical symptoms the experience – the stomach cramps, the constipation, gas, or spasms – and this is because a person’s emotional state can influence the gut and cause digestive problems or conversely, what is happening in your digestive system can adversely affect the emotional state. Because various emotional states can affect the gut and vice versa, some therapies that clinicians offer are effective in relieving the symptoms either way. However the emotional side of the illness does not exist in isolation. Often, because of the way the body reacts to stress, these treatments and therapies will only provide temporary relief and, more importantly, neither do they treat any underlying cause nor do they repair any physical damage that may have been sustained. Firstly, let’s start with how digestive dysfunction can possibly affect how we are feeling or how we react to certain situations. We have to appreciate that the gut-brain relationship is most certainly not a recent discovery, because the links between mood and digestive function have been noted for centuries. A famous observation was made by a physician called William Beaumont who wrote up his findings in 1833 after he had encountered the stomach injury incurred by a man who had been injured by a gunshot. Dr. Beaumont was a surgeon in the U.S. Army who became known as the “father of gastric physiology” following his research on human digestion. The man, Alexis St Martin, had been left with a hole in his stomach which had only partially healed and which allowed Beaumont to observe what happened during the digestive processes. One important conclusion was reached when Beaumont discovered that St Martin actually produced less stomach acid when he experienced stress-related moods such as fear or anger. He discovered this by dropping food through the hole attached to a piece of string and retrieved only partially degraded remnants in comparison to the stomach acid produced when St Martin was in a relaxed state of mind which had an effect of more fully degrading the food. The control of man’s diet is readily accomplished, but mastery over his intestinal bacterial flora is not, the innumerable examples of auto-intoxication that one sees in his daily walks in life is proof thereof. They are the cases that present…malaise, total lack of ambition so that every effort in life is a burden, mental depression often bordering on melancholia, frequent attacks of indefinite abdominal pains due to flatulency, sudden attacks of acute diarrhea alternating with periods of acute constipation. By the mid 1930s the interest into auto-intoxication had waned and only recently has medical science rekindled the flame of the gut-brain connection as it continues to evidence not only how dysbiosis can affect the mind but also how a person’s moods can adversely affect their gut. Dr. William Beaumont discovered long ago that negative states of mind could inhibit the production of stomach acid, thereby negatively affecting the gut, and he achieved this in an era when medicine still believed that digestion in the stomach was primarily a mechanical and not enzymatic process. A direct link is that poor digestion results in a lower absorption of proteins resulting in lower production of amino acids, which in turn will result in fewer neurotransmitters being produced. The end result is that lower levels of serotonin will mean that our mood suffers. But the problem is a cyclical one and it also is not limited to mood problems but also those founded in the physical. What we have come to understand is that alteration of mood is no different to a physical problem such as stomach pain. They are both merely a symptom of an underlying problem rather than being individual illnesses occurring in isolation. For example, if a patient is suffering from depression due to a lack of sufficient amino acids, and there is no practical reason for that person to be depressed, then the likelihood is they may also be suffering from other nutritional deficiencies which in themselves may produce both physical in addition to psychological reactions. Treating the psychological problems either by natural or pharmaceutical medication or relaxation therapies may work to partially relieve some of the symptoms, but the underlying cause still remains a mystery, as do the majority of their apparent physically issues and any internal damage caused by the digestive dysfunction. The whole situation then becomes compounded because we know that stress in itself produces digestive dysfunction and, even if we simply limit our understanding of it to the findings of Beaumont and St Martin, we can clearly see at least some of the problems which may arise. Yet still we are not taking into deep consideration the ‘fight or flight’ responses, or those of ‘rest and digest.’ Nor are we looking at the enteric nervous system, hormonal responses or adrenal gland fatigue. Stress has the ability to reduce the way our digestive system functions on many different levels by way of the hypothalamic-pituitary-adrenal (HPA) axis. We all face small stresses on a daily basis in the form of any demands placed upon us. An inhibition of digestion will occur with even the smallest of stresses resulting in a drop in the production of digestive enzymes right through to constipation. The sympathetic nervous system (fight or flight) branch of our autonomic nervous system is responsible for allowing us to cope with just about anything life throws at us by activating all our body’s systems, priming them for action. Unfortunately, an active digestive and immune system are not important when we are under stress and essentially become de-activated. The parasympathetic nervous system (rest and digest) become activated as we rest up and relax, and in turn our body responds by improving virtually all aspects of the way we digest and absorb our foods. Our immune system restores, reducing inflammation and our ability to heal speeds up. A stressful life, when it comes to digestive function, is self-perpetuating and can lead not only to deeper levels depression and anxiety but also multiple physical problems such as irritable bowel syndrome, an increased likelihood of SIBO or Candida infections, food allergies, leaky gut, auto-immune disorders, etc. If the patient’s stress remains chronic, long-term and unmitigated, these stress-related gut problems can result in chronic long-term poor health for the patient. In my clinical experience, most all patients who present with “incurable” digestive problems and who have been to many doctors will also present with HPA dysfunction. Unfortunately in most all of these cases the patient was treated separately for their mood disorder, and little to no stress-related mind/gut connection was explained, thereby allowing the patient to understand the true nature of their multiple health problems. I explain to patients that symptoms are our best teachers, and not enemies to be “conquered” with pills, fad diets or surgery. Clearly, individual patient-focused treatments and relaxation therapies can help significantly. Yet since we no longer have to face physical dangers and be aware and alert every waking minute of the day, how can we positively influence our gut on a daily basis? More to the point, why are our bodies inappropriately reacting in the way they are and what can we do to make a positive change? In sensitive people the brain is profoundly influenced by afferent impulses coming from a distended, underactive, or unduly active bowel. Alvarez’s observation, although apparently simplistic, can be applied not only to the bowel but also how the gut, and subsequently the brain, responds to our internal mechanisms and environment as a whole. Most people now are aware of the body’s physical states of fight or flight (sympathetic response) and rest and digest (parasympathetic response). As mentioned previously, the sympathetic response controls our body when we are required to be in a state of awareness and activity and the other (the parasympathetic response) when we are going about our normal daily routine and are more in a state of relaxation. In practice only one of these systems, which are automatic, is focused on at any given time. And, because they are automatic and react to the tangible environmental signals both inside and outside our body, it means we can’t mentally talk ourselves out of a stressed or anxious state. Yet patients are being told that the modern world is conducive to stress, that multi-tasking is important and that success is dependent on working hard and long hours. Eating over computer screens, working at night, continual social media, mobile phone & email intrusions are today’s norms, and we can understand how these situations can potentially produce negative moods – but just how do such influences switch on our inherent fight or flight mechanisms, after all, in today’s age we are not facing life or death situation running away from dinosaurs. Let’s for a moment examine at a typical stress-related scenario in a little more detail and try to understand exactly how our hectic 21st century lifestyle contributes to digestive, immune, and ultimately emotional problems. Once we become enlightened and aware of what is happening with our stress (HPA) mechanism we can at least make small steps to amending our actions and behaviours. For example, think of an office worker who spends long hours hunched over a computer and consider the body posture. You will find that the upper half of the torso is bent forward. The chin is tilted downward and the mouth is often closed with the jaw muscles tensed. The arms are relatively taut, the shoulders drawn closely together and the chest area becomes narrowed. Breathing is shallow and faster than it should be. Concentration is apparent even in the expression. For many who work in an office this is a well-recognized body posture and one that you will, if you are reading this on a computer, perhaps be doing right now! This is a stance, which, although sitting, is otherwise reflecting a body preparing for a fight. The focus is on the larger muscle groups and the extremities and blood is being pumped to these areas. Your eyes and brain are alert, your neck and shoulders are tensed and, I would guess, your teeth may even even be clenched – even though there is no physical aggressor in sight! Already the digestive system is being affected because the focus is not on rest and digest but fight or flight. Currently your digestion is not functioning at optimal levels because blood is being diverted away from the gut towards the larger muscles and your digestive enzyme output is dropping off. Without being aware of any obvious external stressors, your body is switching mode from rest and digest to fight or flight. Now compare this stance against the same person leaving the office and going straight to the cinema to watch a comedy. This person’s upper torso is angled backwards; her shoulders have a tendency to being more relaxed and wide. The chest is expanded and the chin is up, with eyes open. There is little physical tension in her facial expression. The arms are relaxed, the breathing is easy and a little deeper, and the blood pressure is a little less. This is the mind, body, and digestive system in rest and digest mode. After having studied the effects of stress on my patients in the clinic for many years, I’ve come to the conclusion that some of the biggest stresses we face as humans involve our relationships with other people, particularly those we are close to, and many people can relate to the fact that there is one person they know like a son, an ex-partner, an employer or employee, a mother-in-law or daughter-in-law, etc. ; that may be causing them stress right now, ranging from mild and occasionally right through to the severe and extreme. I’ve noticed that most people consider the physical stresses to be the most toxic to the body, like chemicals such as heavy metals for example, but I believe that it is the continual low-grade emotional stress that causes us the most harm in the long-term. These kinds of stress continue on and on often going unnoticed and sit in the background of our mind, sometimes for years or even decades and slowly wear down the ability of our body’s HPA axis to help us recover from all kinds of illness, whether it is a recurring acute or an unremitting chronic health condition. These kinds of intangible stresses tend to be covert and are hidden from our view, virtually un-diagnosable by most doctors and are accepted as being a “normal part of our lives”, unlike parasites, gluten, mercury, candida or microwaves, and the many more overt stressors we generally accept as being the real culprits. As our HPA axis becomes increasingly compromised, our digestive and immune system becomes incrementally compromised as well, and this is generally how we become increasingly hypersensitive to foods and substances in our environment, we develop less resistance to many different types of infectious diseases like urinary tract infections, skin infections, respiratory infections, etc., we have an increased tendency to developing an auto-immune disease like ulcerative colitis, Crohn’s disease, rheumatoid arthritis, Grave’s disease, etc. ; and finally we can even be prone to developing one of the many different types of cancer. It the accumulation of the many and varied different types of stresses which tips the balance, however – the “straw that broke the camel’s back”. And if we can recognize stress for what it is and deal with these different stresses in our lives, whether they are emotional, mental or physical, than we will be in a much better position to avoiding falling victim to a functional digestive problem, because our resistance will be able to remain high and our susceptibility will have the ability to remain low. These continual internal or external low-grade emotional stress responses cause a strain particularly on our glands of stress, the pituitary, ovaries, thyroid and adrenals, and once these powerful endocrine glands become compromised, our susceptibility to virtually any health condition increases significantly. By raising awareness of what we do as individuals on a daily basis and how those actions, the physical actions, can affect our digestion, we can make at least some small adjustments. By understanding that some of our biggest stressors in life are the relationships we have with people we are closely associated with, and learning that we can change how we feel about this person, adapt to the relationship or discontinue the relationship if it is just too toxic, we will be in a better position to reduce the impact of these hidden forms of stress in our lives. We have all been told time and again to take regular breaks from our computer, to go for a walk at least once per day to reverse the sitting disease that is becoming increasingly prevalent in our society. For many this is not an immediately practical solution, but provided you are aware of the effects rather than just the advice, then on an individual basis you can positively affect posture and attitude wherever possible. We also know that our children are advised to leave the computer alone regularly and to ‘get some fresh air,’ and now we are becoming aware of why this is not only good physical advice, but also good advice for improving our children’s digestion, health, mood and behaviour. By providing examples of the differences between these simple scenarios, it becomes much clearer to see that if the body is placed into a sympathetic fight or flight mode on a regular daily basis, even without getting stuck in traffic jams, dealing with irritable teenagers or an even grumpier boss or ex-partner, we are physically telling our body that we are in a stressful situation and it reacts accordingly. The long-term impact of stress on our children has yet to be felt but on adults we are now realizing how such simple, everyday scenarios are impacting on our lives. Making children or adults perform strenuous exercise is not the answer, because physical exertion can also be interpreted by the body as a significant stress in its own right, but helping them to be aware of situations which we never consider as being problematic not only assists in the learning of cause and effect, it can lead to amending behaviours and thereby taking a positive step towards improving our own health and the health of those we care about. 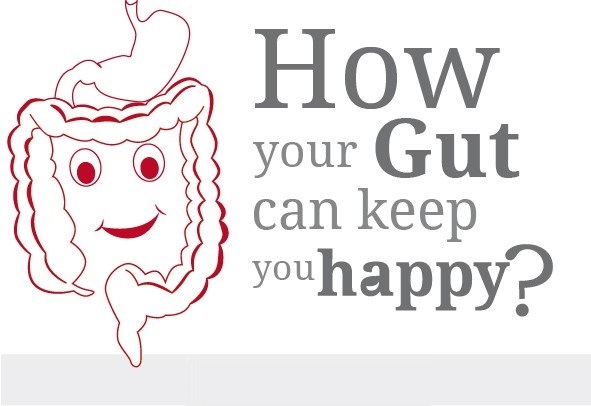 When it comes to your gut making you happy, it is important to realize that simple, everyday activities and emotional responses can trigger it into making us unhappy as well as happy, and by understanding how these triggers work and by making small, personal adjustments we can reduce anxiety and depression and mitigate the symptoms of dysbiosis and mood disorders, which cause so many people so much distress. 1. Stow B: Metchnikoff’s basic principle – intestinal antisepsis through biological aids – attested by the Bacillus Bulgaricus. Med Record 1914, 86:233-36. 3. Alvarez WC. Origin of the so-called autointoxication symptoms. JAMA. 1919;72:8–13. doi: 10.1001/jama.1919.02610010014002. I am in bad shape from auto immune disorders, Psoriatic Arthritis, menopause, meditations . Most of mine, I feel strongly stems from my gut. I dont eat sugar, trarely bread, no white flours, pastas, etc, but as I have aged it seems to be worse. I will get a good probiotic, watch my diet, etc. Thanks immensly for this quiz and answers. Try Canxida Restore and Remove.